There’s nothing wrong here. Especially if you like your margaritas with no salt on the rim. Something vanished between the front of the package and the back of the package. That something was the salt. While the front of the package displays prominently “SALTED”, the back of the package displays the TJ “Low Sodium” tag. Figure that one out. The label says these are “made with stone ground yellow corn”. There’s no reason not to believe that. The chips themselves have a neutral taste and are crispy. As implied, if you like a salty chip, you’ll be disappointed. There’s barely a salt granule in the bag. They hold up well to heaps of pungent salsa. If you like corn tortilla chips, what’s not to like with these chips? 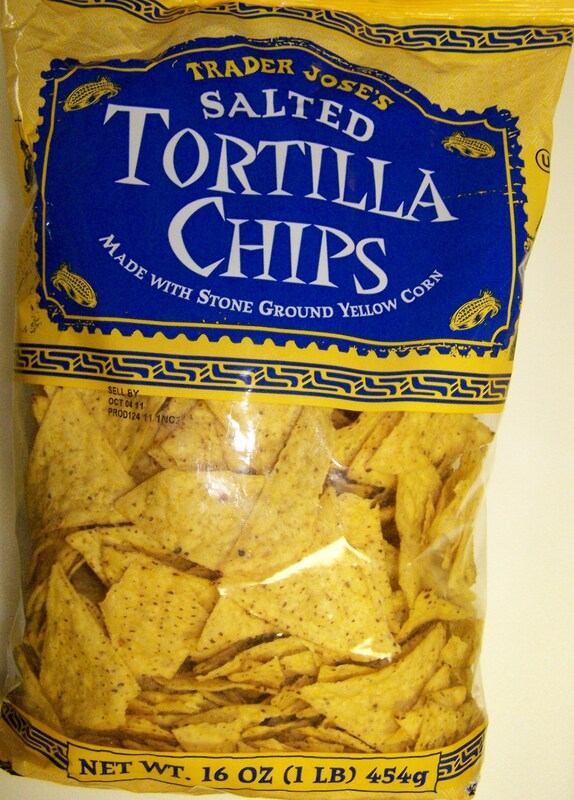 Even if you prefer flour tortilla chips, what’s not to like with these chips? One added benefit, at least for this package, most of the chips were intact chips. There weren’t a whole lot of broken triangle pieces at the bottom of the bag. That’s unlike some other chips where it seems they ran the bag through the flour mill after the chips were made. At $1.99 for a 16 ounce bag, these are an everyday bargain. Trader Joe labels these as “No Gluten Ingredients Used” and “Low Sodium”. This entry was posted on 07/12/2011 at 22:14 and is filed under Recipes, food, cooking and related items, Trader Joe's. You can follow any responses to this entry through the RSS 2.0 feed. You can leave a response, or trackback from your own site.